Laura and I have talked extensively about baking – she makes a mean chocolate pots de creme – and she requested a chocolate raspberry combo as her celebratory farewell cookies. 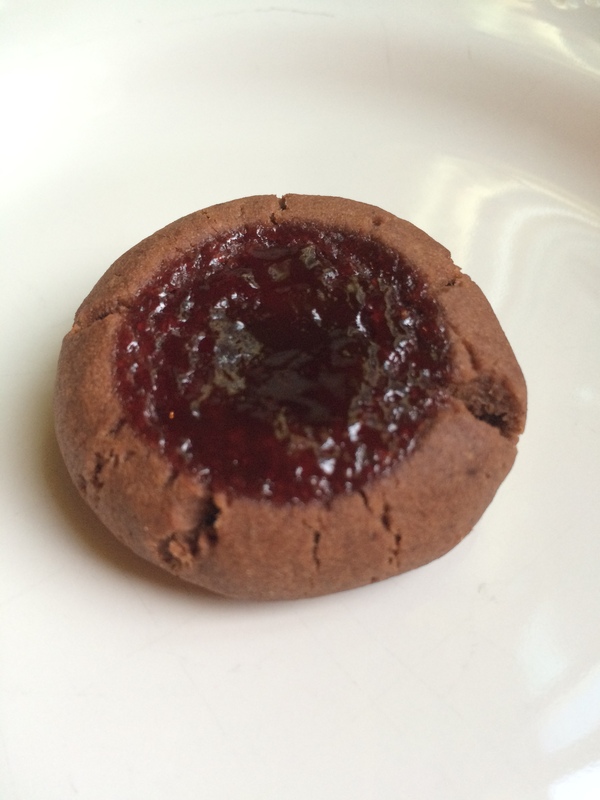 And so, we have these chocolate raspberry thumbprints. The original recipe from Good Housekeeping neglected one very important note in preparation…you have to melt your 2 ounces of baking chocolate before you incorporate it into the dough. Which makes me wonder…how many people tried to make this recipe without melting their chocolate? Farewell, Laura! We shall meet again on social media and in outside-work-life! Preheat oven to 350 degrees. Line three baking sheets with parchment paper. In a mixing bowl, beat butter on medium speed for 1 minute. Scrape down the sides of the bowl and add sugar; beat until well-combined and fluffy, about 2-3 minutes. Add egg, vanilla, chocolate, and cocoa powder mixing well, scraping the sides of the bowl a few times. Slowly add flour mixture, beating until fully incorporated. Using a 1-inch cookie scoop, scoop dough and roll into balls. Place about 2 inches apart on baking sheets. Using your 1/4 teaspoon measuring spoon, press a thumbprint well into the center of each cookie. Fill with 1/4 teaspoon raspberry jam. Bake for 14 minutes, until jam is bubbly at the edges. Remove from oven and cool for 1-2 minutes on the baking sheets, then remove to a wire rack to cool completely. Store in an airtight container at room temperature; if stacking, place waxed paper between the layers. I have never made thumbprints. But always wanted to! This looks like a delicious combination. Looks like a perfect cookie exchange cookie. I am thinking about it for Christmas…. I recommend using semisweet baking chocolate for these if you make them – while these were quite tasty I think a semi, rather than unsweetened, chocolate would be even better! let me know if you make them!